Power Integrations today announced the release of its BridgeSwitch™ integrated half-bridge (IHB) motor driver IC family. BridgeSwitch ICs feature high- and low-side advanced FREDFETs (Fast Recovery Diode Field Effect Transistors) with integrated lossless current sensing, resulting in inverter conversion efficiency of up to 98.5% in brushless DC (BLDC) motor drive applications to 300 W. Superior efficiency along with the distributed thermal footprint provided by the IHB driver eliminates the need for a heatsink, reducing both system cost and weight. 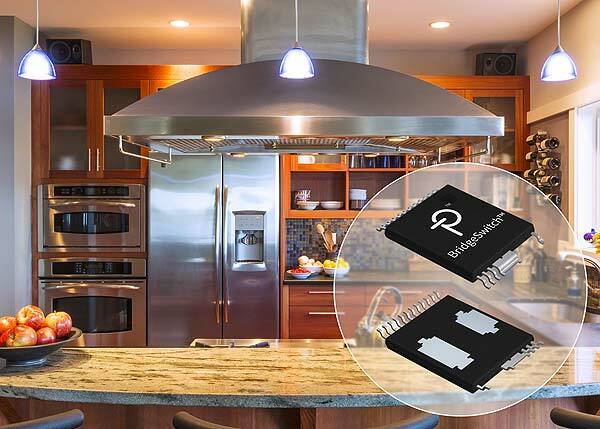 Integrated lossless current sensing, bus voltage sensing and system-level thermal sensing makes this device family ideal for BLDC motors in home-appliance applications. BridgeSwitch devices target refrigerator compressors, HVAC system fans and other residential and light commercial pumps, fans and blowers. Samples of BridgeSwitch ICs are available now and are priced at $1.69 in 10,000-piece quantities. Visit PI’s new motor drivers sub-site for technical support at: https://motor-driver.power.com/bridgeswitch.